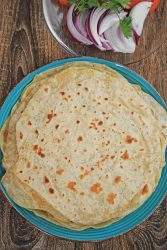 Yufka is a very thinly rolled Turkish flatbread made with just the basic ingredients. It can be used to make wraps or as a pastry sheet for desserts. In a wide bowl, add the flour and the salt. Mix well to combine. Slowly add the warm water to form a dough. Add the olive oil and start kneading the dough until it is very soft and smooth. Cover the dough and let it rest for about 4 hours or even overnight. The longer it rests, the easier it is for us to roll as we have to roll the dough really thin. Once the dough is rested, divide the dough into 10 equal pieces. Let the dough balls rest for about 15 minutes. Dusting each ball with enough flour, start rolling the dough. Roll it as thin as possible without tearing the dough. If the dough resists rolling, rest it for few more minutes and then roll again. Heat a heavy pan and cook the rolled Yufka on medium high heat until golden brown on both sides. Remove from heat and keep in between kitchen cloth until ready to serve. The yufka tends to harden very quickly. It can be sprayed/sprinkled with warm water before serving to soften it.